As I get more into knitting, it’s interesting to draw comparisons between my habits as a seamstress and my habits as a knitter. When I first started sewing, I would begin projects with a pattern I found intriguing, and then try to find the right fabric to match. As I have grown more in my sewing, I’ve learned that, more often than not, my most successful projects begin with the fabric first. I spend some time draping it over my dress form, studying its texture and weight, until it “tells” me what pattern I should use for it. As a still-beginning knitter, I usually start with the pattern, but occasionally I begin projects with a really unique yarn find. And that’s how today’s project came about. During one of my weekly visits to Twill, I noticed a gorgeous new yarn that had just been stocked – the Debbie Bliss Rialto Luxury Sock Yarn. Yes, that’s a real mouthful! 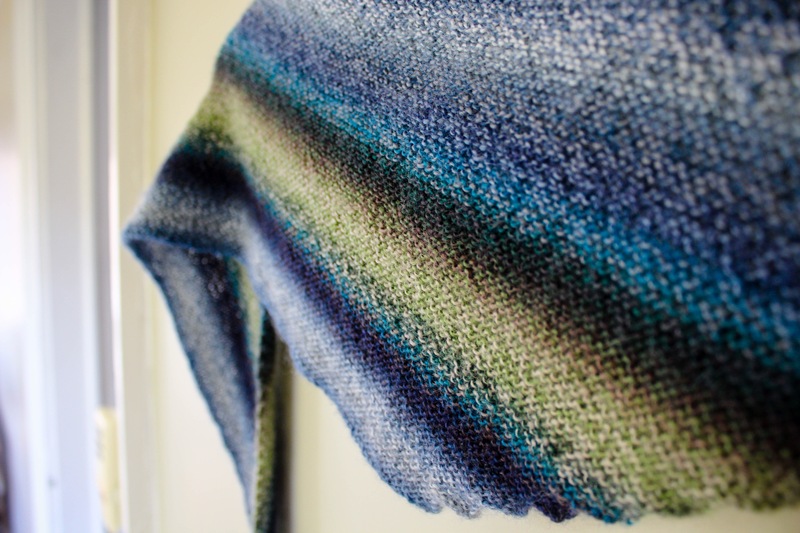 The yarn, though, is a gorgeous, delicate variegated yarn with delicious color gradations and striping. 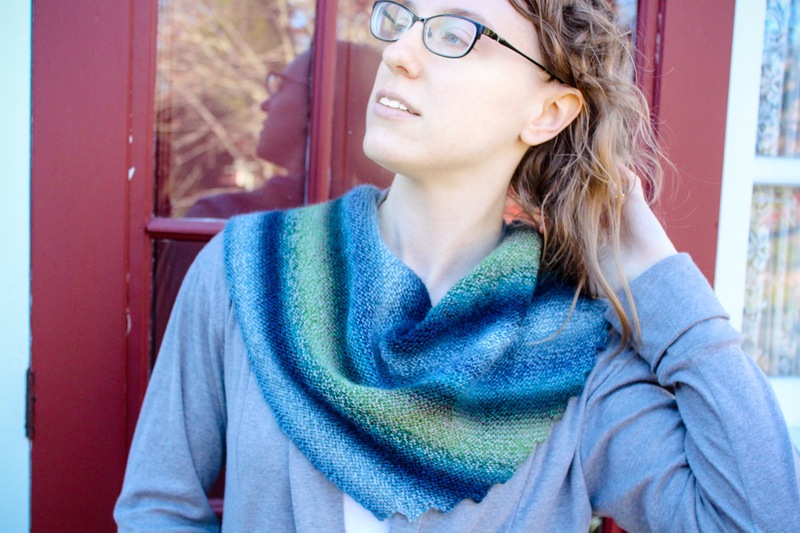 I knew I wanted a simple project so that I could show off the yarn’s inherent beauty, and after some hemming and hawing, I settled on the Hitchhiker shawl pattern that has been making the rounds at Twill. 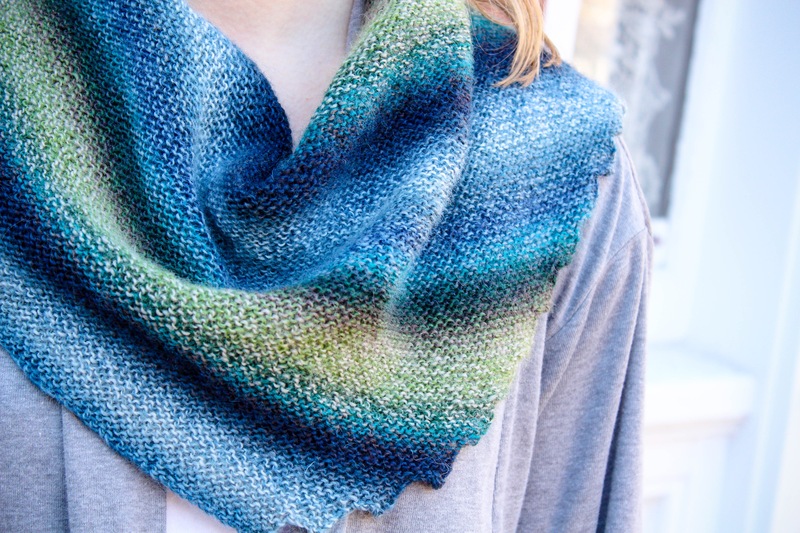 It’s a very simple pattern – you begin by casting on two stitches, and then just increase from there, with occasional cast-off sections to create the ridges – but it was so fun to make in this yarn. It was almost like reading a mystery novel – I was never quite sure what the next color would be, and was delighted to see the colors unfold before my eyes. I made this at the beginning of September, which was the great “month of weddings” – my grad school roommate and my younger sister both got married within a week of each other, so I had quite a bit of traveling to do! 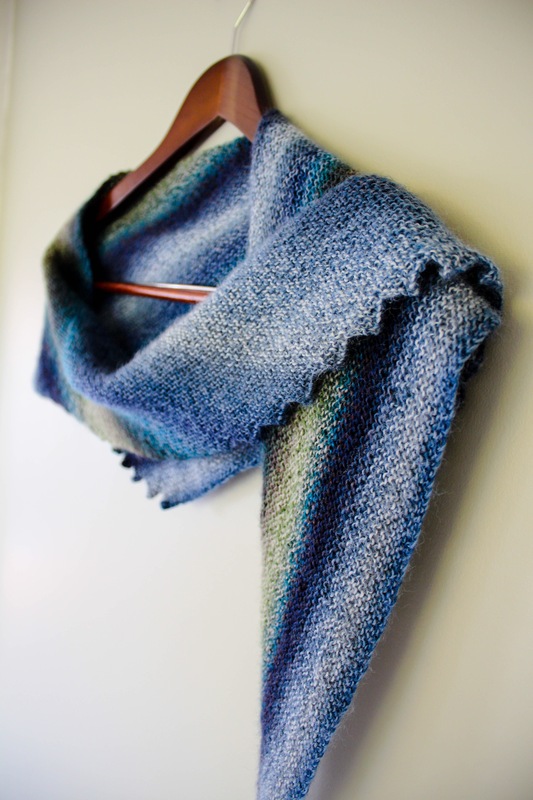 This project was perfect for those on-the-go days since it took only one skein to knit the entire shawl, which made it very compact to shove onto purses or bags for the next train/bus/car ride. The pattern was also simple enough that I could put it down and pick it back up again quickly, which was definitely a plus! I’m so pleased with how the project turned out, but I’m still trying to figure out how best to wear it! 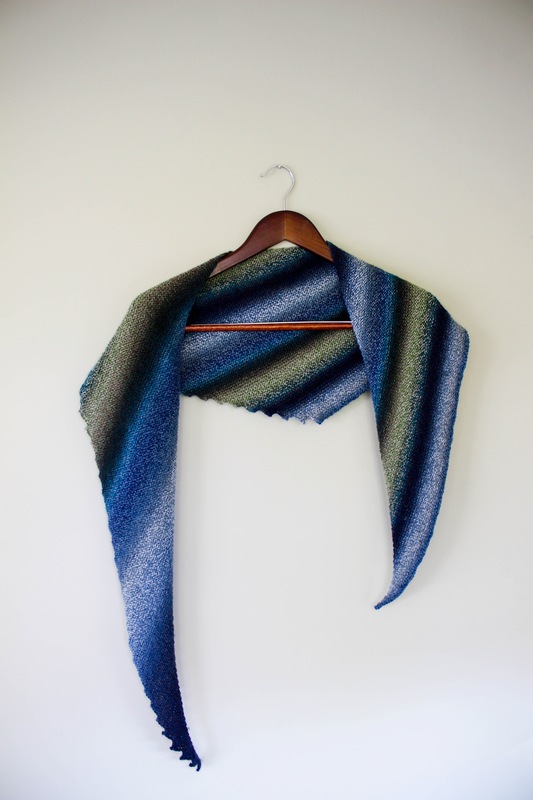 I’m not used to this whole shawl accessory thing – do any of you have tips for how best to pair it with outfits? I’d love to hear your ideas! Linda of Nice dress! Thanks, I made it!! Lovely wool! I think it looks nice wrapped around you neck in the photo given – like a contrasting collar.